Lisa Lieberman-Wang joins Deidre and JG to share “wiZdoms” on the secrets to squelch self-sabotaging behavior. Sometimes it seems that we just can’t get out of our own way. We believe we want to achieve certain goals, and can often sabotage ourselves with behaviors that will prevent us from achieving the things we say we want! Joining GutwiZdom in this episode, Lisa Lieberman-Wang, a relationship and emotional breakthrough expert and the author of the bestselling book, FINE to FAB, Lisa shares her incredible story about how she quit her self-sabotaging behaviors, and how you can too! Download your free copy of Lisa’s E-book here and listen to the full episode for more great “wiZdoms”! First ask yourself this question. Do you want help? If you want to stop self-sabotaging, you must be open to getting help. Stop thinking you’re not good enough. If we feel we’re not good enough, we will find things in our life to support that belief. This all starts at a very young age, like a seed being planted, but we can change those beliefs! Be“lie”f. We believe the lies we tell ourselves, and maybe the lies others have told us about ourselves. We say, “I can’t do that” or “this is too hard” but these beliefs may actually be false! Acknowledge your fear or doubt. 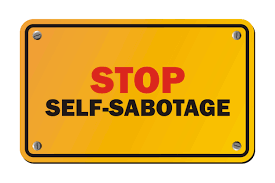 When we simply change one self-sabotaging behavior, and replace it with another self-sabotaging behavior, we’re not getting to the root cause and eliminating our own worst enemy – ourselves! For example, if we want to lose weight and we change our habit of eating out more than 1x per week, that’s not going to help us achieve our goal of losing weight if we still binge eat cookies at midnight. Take inventory of life’s lessons and beliefs. What is it that made us think this way about ourselves? Change the model and create new lessons. Stop waiting for perfection. If we wait for perfection, we will take no action. If we take no action we will always fail. Make peace, practice gratitude and celebrate! Gratitude is not just an attitude, it’s a behavior and something that can be practiced every single day. If you’re interested in the GutwiZdom Journal of Gratitude, email Deidre at: dk@gutwizdom.com for your gift! LISTENERS: How will you stop self-sabotaging? Share your experiences and “wiZdoms” with us! Either leave us a voicemail at 646-653-9278 or send us an email. We may talk about it - or we may even talk with YOU - on the air!